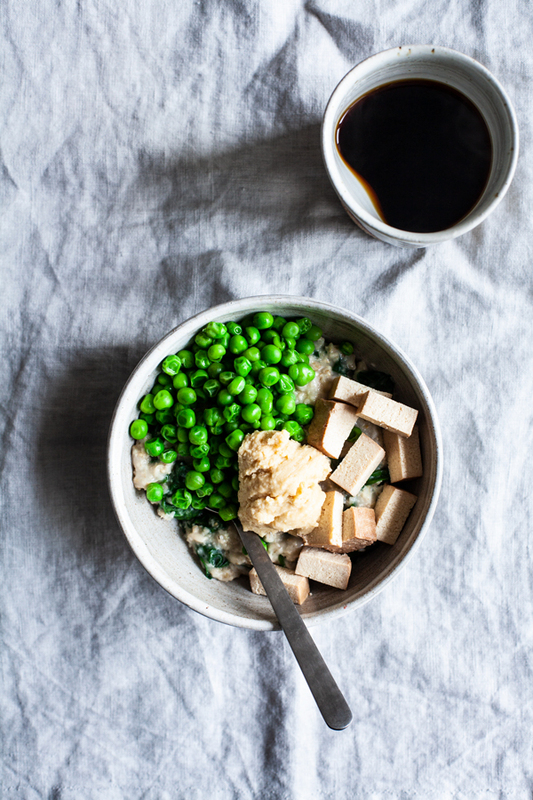 I posted these savory spring oats on Instagram a month ago, without the intention of blogging about them, but a few folks immediately requested the recipe (if it can even be called that!). 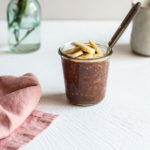 I’ve made them enough in the last few weeks that it’s definitely time to share; they’re one of a few simple meal formulas that carried me through the end of a very busy spring semester. My formula for savory oats begins with 1/2 cup rolled oats, a cup of water, a pinch of salt, a tablespoon of nutritional yeast, and a big handful of baby spinach. That’s the oat base. It’s the same one I use in this recipe, which is a favorite, and in the two savory oats that made it into Power Plates. This base can be seasoned to taste with salt and pepper, made spicy with a pinch of crushed red pepper flakes, or given zest and variety with turmeric, curry, cumin, harissa, smoked paprika, and a host of other spice blends. 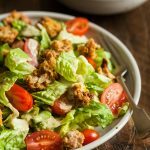 It really depends on what I’ve got in my fridge and what needs using up, and possibilities are endless; this is a quintessential “clear out the fridge” meal in my home. 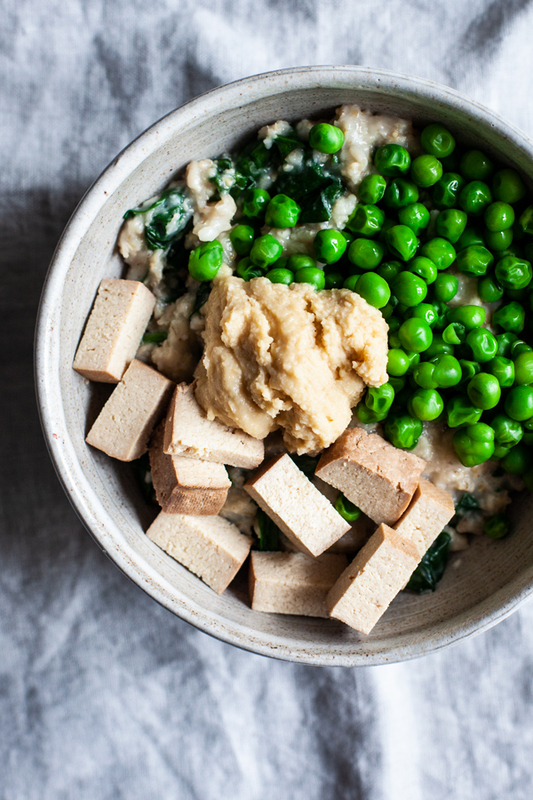 In this case, I had frozen peas, some leftover hummus, and smoked tofu. 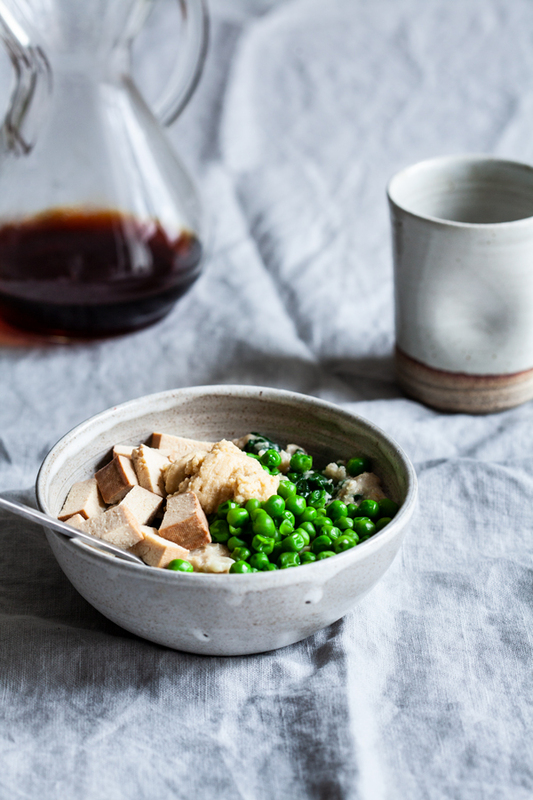 The smoked tofu from the SoyBoy brand is my jam, and a staple for me (I can usually find it locally without too much trouble), but any marinated and baked tofu, commercial or homemade, would work. 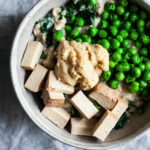 I love the contrast of smoky, firm tofu cubes and light, sweet peas, and I added a little lemon zest to the dish to give it even more seasonal brightness. 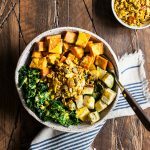 It is an incredibly filling and satisfying morning meal, and it’s equally good for a simple, one-pot & single serving lunch or dinner. Place the oats, water, and salt in a saucepan. Bring to a boil, reduce heat to low, and simmer until the oats are starting to thicken but aren't yet fully cooked (about 3-5 minutes). Stir in the nutritional yeast, lemon zest and juice, and then add the spinach; cover the oats and allow the spinach to wilt down for about a minute. Then, remove the lid from the oats and stir the spinach in. Continue cooking for another 2-3 minutes, or until the oats are creamy and have reached a desired consistency. If they get overly thick, you can always add a splash of water. Taste and adjust salt and pepper as needed. While the oats are cooking, you can steam, simmer or microwave the peas till tender; if you prefer, you can also stir them into the oats while they cook (I like to pile mine on top, but it creates another step). 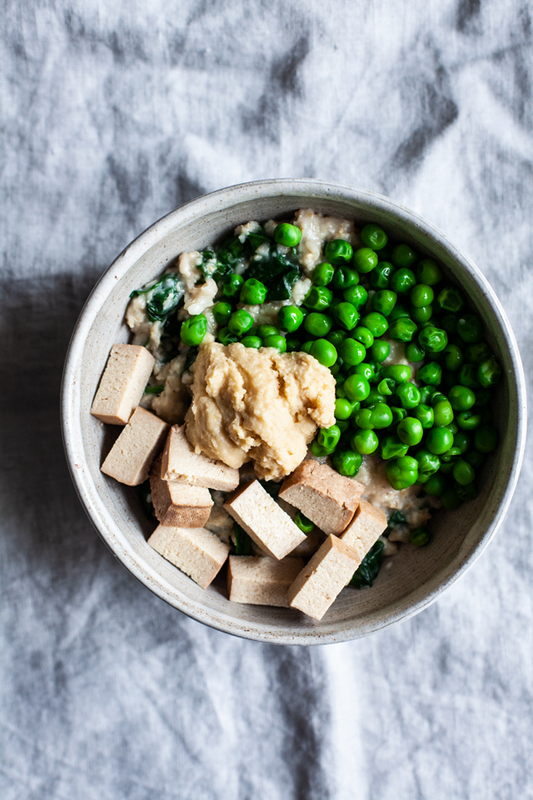 When the oats are ready, top them with the peas, tofu, and hummus. Serve right away. I’m slowly settling into a period of rest post-graduation. Having space and time all of a sudden feels a little strange, but I’m grateful for it and giving happy thought to the summer months ahead. See you before too long, for another weekend roundup. You know? I have never even considered the possibilities of savory oats! It is always loaded up with sugars and fruits and nuts. But why not make it savory?! It’s no different than a barley or quinoa really. I will have to try this! I love that you shared a wide variety of options–something everyone would like!